Is there any need for these OC editions any more? Faster, cooler and for only another £13 on top of the price of the vanilla AMD Radeon HD 7870 - why wouldn't you go for the new Sapphire HD 7870 OC Edition? The mid-range Southern Islands/7-series/Graphics Core Next (GCN) cards from AMD have impressed us. They may not have the raw graphics grunt of the Tahiti GPUs in the excellent HD 7950 or the crazy-expensive HD 7970, but they're hitting some decent price/performance numbers. The HD 7870 and HD 7850 are like-for-like replacements for the HD 6950 and HD 6970, at similar prices and with extra pace to boot. They also benefit from the new 28nm production process, which provides extras like the Zero Core Power tech that enables seriously low-power states when the monitor goes to sleep. It also makes them serious overclockers, and that's why we've been waiting with bated breath for board partners to bring out special factory-overclocked cards just like this Sapphire HD 7870 OC Edition. The HD 7850 is our favourite of the new mid-range graphics cards, for the simple reason that it outperforms the HD 6950 it's replacing, and comes in cheaper too. The HD 7870 is a tougher sell as it's only slightly faster than the HD 6970, and is a little more expensive. That's not a great combination, but as we've said, you get the goodness of the 28nm GCN architecture, and there's that overclocking headroom too. 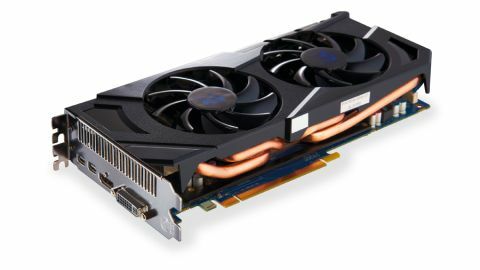 Sadly though, Sapphire has been rather conservative with the overclocking of this card. The vanilla card is also known as the GHz Edition, sporting, as it does, a full 1GHz clock speed. This OC Edition only comes with a paltry 50MHz boost over the stock speeds. That's disappointing when we had the stock AMD reference edition with the standard cooler running happily with a 1.2GHz clock speed. As you might expect then, the extra 50MHz on the factory-overclocked card doesn't amount to a lot in terms of performance. So why opt for one of these factory-overclocked cards over the vanilla version when you're only getting an extra 50MHz? Well, theoretically you ought to be able to push the GPU clock further on this Sapphire OC Edition thanks to the third-party cooling array it has screwed onto the PCB. That's the theory, but in practice it doesn't quite work out like that. The reference HD 7870 and the Sapphire OC Edition both top out at the same 1,200MHz overclock, both hitting roughly the same running temperatures. The AMD reference cooler was maybe slightly hotter under full load, but only by 2-3°C. We're actually hitting the overclocking limits of the silicon before we start to reach any thermal limitations, which kinda makes the extra cash you're spending on these sorts of cards a little redundant. Back when the stock coolers were significantly worse than third-party options, cards like this made sense. Now you're not really getting much more for your money, and it's not like that extra miniscule overclock is worth it in terms of avoiding invalidating your warranty either.